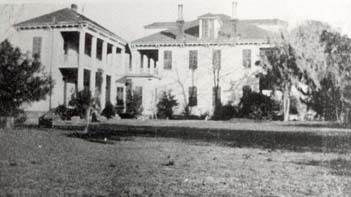 Photograph, picture of Oaklawn, the Allen Ranch plantation home. Courtesy of Early Texas History. Image available on the Internet and included in accordance with Title 17 U.S.C. Section 107. ALLEN RANCH. 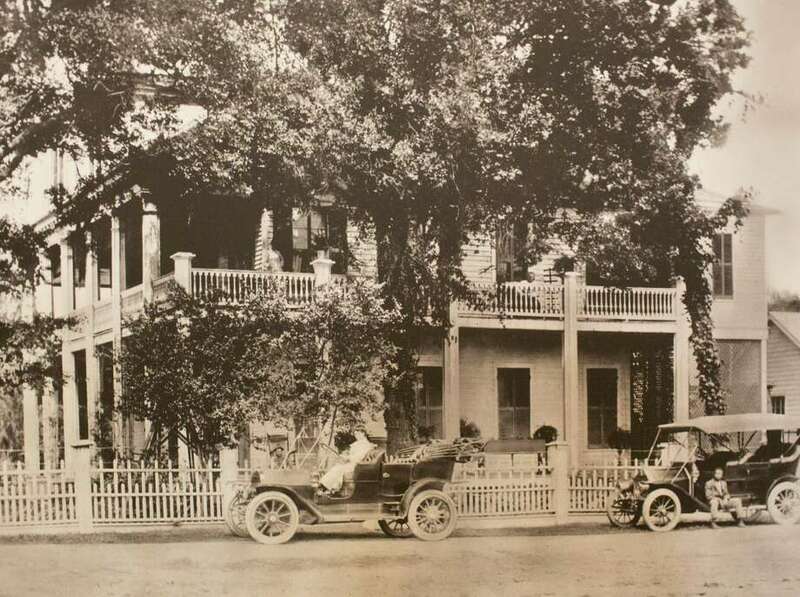 The Allen Ranch, with headquarters in Harris County, was established in the early 1840s and operated for more than 100 years. It became the largest ranch in the region. Its operations ranged from the Trinity to the Lavaca rivers and extended into four counties. Photograph, picture of longhorn cattle at Allen Ranch. Courtesy of Early Texas History. Image available on the Internet and included in accordance with Title 17 U.S.C. Section 107. Samuel William Allen started ranching on the south side of Buffalo Bayou, now the Houston Ship Channel, about eight miles east of Houston. His wife, Rebecca Thomas, daughter of Ezekiel Thomas, inherited 350 acres from her uncle, M. A. Callihan, that became part of the Allen Ranch. Like his neighbors and friends Andrew Briscoe and Francis R. Lubbock, Allen started his ranch by rounding up the prolific longhorn cattle that had run wild since Spanish times along the Gulf Coast. By the 1860s Allen had acquired exclusive cattle-shipping rights from the Morgan Lines and had a virtual monopoly on the trade to New Orleans and Cuba. He formed cattle partnerships with other ranchers, including Abel H. (Shanghai) Pierce. 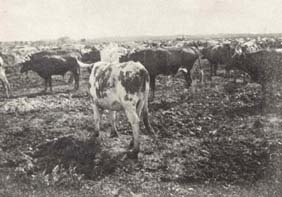 Pierce once estimated that he and Allen owned over 100,000 cattle. In 1871, as a personal favor, Allen bought out Pierce's interest. He also helped out former governor Lubbock by buying his ranch and then hiring Lubbock to represent Allen's Galveston-based firm, Allen, Poole, and Company. The Galveston, Houston and Henderson Railroad was built through the Allen Ranch in 1859. Allen shipped cattle by steamer from Galveston, Palacios, and his dock on Buffalo Bayou. He also operated tallow and hide-rendering plants on Buffalo Bayou and in Galveston. Photograph, portrait of S. E. Allen, son of Samuel William Allen. Courtesy of Early Texas History. Image available on the Internet and included in accordance with Title 17 U.S.C. Section 107. As a result of internal financial misdealings, Allen, Poole, and Company went into bankruptcy in 1874, but S. W. Allen's ranch continued and prospered under the management of his son, Sam Ezekiel Allen. In 1876 the Morgan Lines moved operations from Galveston to a new wharf opposite the Allen Ranch's docks. The Gulf, Colorado and Santa Fe Railway was built through the ranch in 1883, as was the La Porte, Houston and Northern Railroad in 1893. In 1900 the Allen Ranch extended over 17,000 acres in Harris County and had pastures in Galveston, Fort Bend, and Brazoria counties. S. E. Allen concentrated on upgrading the quality of the herd and shipped trainloads of feeder cattle to the finishing ranches of the West Texas plains. Oaklawn Place Samuel Ezekiel Allen Ranch House, located at the confluence of Buffalo and Sims Bayous, built circa 1875, later the site of the Sinclair Oil Refinery, one of the first on the Houston Ship Channel, March 13, 2014 in Houston on display at Treebeards. Image available on the Internet and included in accordance with Title 17 U.S.C. Section 107. After Allen died in 1913 his grandson, Robert C. Stuart, began liquidating the ranch holdings. Many streets and subdivisions of southeastern Harris County bear the names of the Allen family because they were once part of the ranch. S. E. Allen's son, Sam Milton Allen, continued to ranch on 386 acres in Harris County and 10,000 acres in Brazoria County. S. M. Allen's ranch was liquidated in 1947, after his death. Afterward, other descendents still maintained small ranching operations on land inherited from the original ranch. Chris Emmett, Shanghai Pierce: A Fair Likeness (Norman: University of Oklahoma Press, 1953; rpt. 1974). Houston Chronicle, June 24, 1917. Frances Richard Lubbock, Six Decades in Texas (Austin: Ben C. Jones, 1900; rpt., Austin: Pemberton, 1968). C. David Pomeroy, Jr., Pasadena: The Early Years (Pasadena, Texas: Pomerosa Press, 1994). Jesse A. Ziegler, Wave of the Gulf (San Antonio: Naylor, 1938). Handbook of Texas Online, C. David Pomeroy, Jr., "ALLEN RANCH," accessed April 23, 2019, http://www.tshaonline.org/handbook/online/articles/apa01.